Few vehicle models were released in 2017 with as much anticipation and hype than the 2018 Kia Stinger. For Kia, it was a project that was nearly a decade in the making with first concepts dating all the way back to 2011. The release of the 2018 Kia Stinger marks a new era for Kia, with it being the first Gran Turismo and the car model, that Kia believes, will change perceptions of Kia. For many, the 2018 Kia Stinger lived up to the hype and then some. Most who have gotten the chance to get behind-the-wheel of one can't believe they're in a Kia! The Stinger hasn't been available long, with it just hitting dealer floors in late November or early December 2017, so let's take a closer look at what makes the 2018 Kia Stinger so special! It's not a true, exemplary Gran Turismo without the engine underneath the hood. With the available 3.3-liter twin-turbo V6, you get all the power you would expect in a Gran Turismo with 365 horsepower and 376 lb.-ft. of torque. With that kind of muscle, you can go from 0-60 mph in a blistering 4.7 seconds! All the muscle and power underneath the hood is great, but you also want to turn heads with style on the street too. The 2018 Kia Stinger has plenty of that. Choose from seven different exterior colors: Micro Blue, Snow White, Aurora Black, Sunset Yellow, Ceramic Silver, Hi-Chroma Red and Silky Silver. Also, you can choose from three different interior leather color options: light gray, red Nappa and black Nappa. 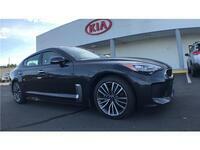 The 2018 Kia Stinger also comes with the advanced technology you would expect from a Kia. The floating touch-screen display also features standard UVO eServices and Apple CarPlay and Android Auto for maximum functionality and convenience with your personal smartphone applications. Plus, the 7-inch Thin Film Transistor LCD screen between the gauges will show your vehicle and driver information more clearly than ever. 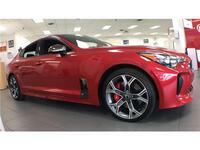 Test Drive the 2018 Kia Stinger at Citrus Kia in Crystal Palace, Florida, Today! Want to learn more about the exciting 2018 Kia Stinger? Ready to get behind the wheel of one? Contact our staff at Citrus Kia for more information or to schedule a test drive today!